The 1968 Chevrolet Camaro is a first generation GM pony car, which, before the 1967’s, with the same body style, hit the market was referred to a “Panther” by company execs. When asked about the curious designation, according to We Love Camaros, the GM executives would playfully respond that the “Panther” is a small, vicious animal that eats Mustangs. This was due to the fact that the first gen Camaro was released, along with the first gen Pontiac Firebird to compete directly with the extremely popular Ford Mustang. The 1968 Chevy Camaro was given a handful of designations over the years, including pony car, muscle car, intermediate touring car, and sports car. No matter what term was used to describe it, however, it was a wildly popular ride, and still is today. A total of 245,147 Camaros were produced for 1968, with the majority of those being the base coupe according to Old Ride. Other models included the base convertible, the Rally Sport Camaro, the Camaro SS, and the Z/28 Camaro. The six cylinder Camaros for 1968 included the Series 23 Camaro Sport Coupe (with almost 50,000 produced) and the Series 23 Camaro Convertible (with under 3,000 made), as noted by 1968SS. 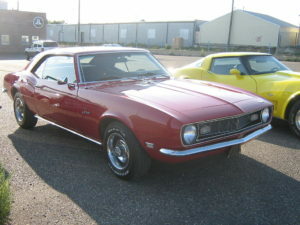 In comparison to a lot of other cars in the market for 1968, the Camaro was fairly small and light, and the combination of its light weight and powerful engines drop it squarely in the heart of the muscle car genre. The car’s total length is 184.7 inches and its wheel base comes in at 108 inches. The Camaro for ’68 measures 51.5 inches tall and 72.6 inches wide. The nickname Panther may have been an insider’s joke before the first gen Camaros hit the market, but its sleek stance and powerful performance delivered a certain amount of raw magnetism and appeal that’s not unlike the panther and kind of unusual to find in a machine. Part of the reason Classic Cars Online US exists is to help connect classic car buyers and sellers, and we’ve added several ways for you to connect – pick your favorite, or join us in all four places: (1) sign up for the newsletter on the upper right side of this page, or 2) visit the Classifieds page here on the site, (3) visit and like this site’s Facebook page, (4) the Best Classic Cars for Sale Online page or (5) join the Classic Cars Online: Classic Cars for Sale group if you are looking to buy or sell classic cars such as the classic 1968 Chevrolet Camaro.